I am currently in the process of reading more than a few books this month but of the ones I finished this one was by far my favourite. Kay never comes to mind when I speak of Canadian authors, which strikes me as being weird because I have never read anything of his that I didn't love. A Song For Arbonne is no exception to that rule. 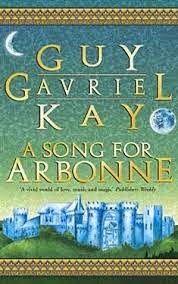 Set in a matriarchal country enamored with troubadours it starts with a woman on her way to visit someone when she is "taken hostage" by someone who turns out to be her paramour. Then the story jumps forward and changes characters and you her story bit by bit which is both slightly annoying and absolutely brilliant. Overall I would say it's a great read if you like historical fantasy type books. If you want to check out what the other bloggers read this month head to The Armchair Squid where the list lives. Happy reading everybody! Wow, he's from Saskatchewan (just looked him up)! Given the first name, my first guess was Quebec but no. What other Canadian authors do you like? I have read a few, though most of them comic artists (hardly a bad thing, mind you): Guy Delisle, Chester Brown, Seth. Margaret Atwood, Lucy Maud Montgomery, Farley Mowat and Margaret Laurence are all on my list of much loved authors. It is however hugely publicized that they are Canadian, I can't help put wonder how many books I have on my overburdened bookshelves that I have loved that are by Canadian authors as I usually don't think about it. I am going to start paying more attention to these things. Awesome. I've become quite a Canada-phile in recent years. We're only about 45 minutes away from the border. Would you say this is more adult, or young adult? I get the feeling it's an adult book. I do love a good fantasy if the world is brilliant--and what's not to love about a matriarchal society! I would say it is more adult. An interesting review--thanks for sharing. Sounds an interesting book. Are Canadian authors different to other authors? Is that why you like them? I think the only one I actually know about is Louise Penny, a brilliant writer.